Part of the pre-draft process for many aspiring NFL players is being courted by agents. For some, it can be a difficult decision. For at least one player hoping to hear his name called this year, the choice was pretty easy. 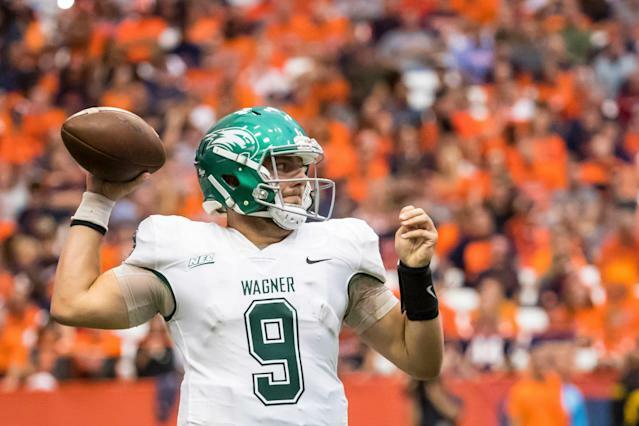 Quarterback T.J. Linta, who was a two-year starter at Brown University and spent last year at Wagner as a graduate student and fifth-year redshirt, is the son of longtime NFL agent Joe Linta. So when it came time for him to choose representation, it wasn’t a long process. “After an exhausting search, I finally settled on JL Sports,” T.J. joked to Associated Press reporter Barry Wilner. Joe Linta’s client list isn’t extensive, but he’s been a certified agent for almost 30 years and is well-known and respected in league circles, in part because he also coached at the college level for nine years. He counts Joe Flacco among his roster of clients, as well as New England Patriots backup quarterbacks Brian Hoyer and Danny Etling, and Tampa Bay tight end Cameron Brate and Houston Texans defensive coordinator Romeo Crennel. And now, he’ll be trying to get his son on an NFL roster. T.J. wasn’t one of the 17 quarterbacks invited to the scouting combine, though he did attend a regional combine in Kansas City. And when he had a pro day at Columbia, 17 teams had coaches or scouts there. Listed at 6-foot-3 1/2, T.J. knows the odds he’s facing, and is trying to use them as a positive. After an All-New England career at Hamden Hall County Day School in Connecticut, T.J. chose Brown over his father’s alma mater, Yale. He became the starter as a junior, playing in eight games, and played in 10 games as a senior. After earning a degree from Brown, T.J. enrolled at Wagner College, also an FCS school. He played in nine games last fall, completing 111-of-217 passes for 1,481 yards, with 13 touchdowns and 4 interceptions. His final two games were his best by far: at Bryant and at Robert Morris, he completed 28-of-42 passes for 444 yards with four TDs and one INT. The Seahawks also had an All-America running back, Ryan Fulse. Joe Linta speaks highly of his son’s ability, but makes it clear that he is working overtime to give T.J. an honest assessment - and not just as a father. “Look at the plays he makes on film: he plays like a real quarterback. He has the arm strength and the brain and the physicality, doesn’t flinch in the wake of getting blasted in the pocket,” Joe said. “Yeah, it’s a little weird when calling a general manager or personnel director and talking about your kid. But I’m not going to be apologetic. It’s 99 times out of 100, the most important grade for a player is my own,” he continued. “I’ve been doing it for 100 years. In this case, because of the nepotism, I wanted to make sure I did not have beer goggles on. Am I seeing what I think I am? Former NFL quarterback Jim Miller, a host on Sirius XM NFL radio who evaluates the position, sees positives in T.J. too. Former longtime NFL assistant coach Chris Palmer put T.J.’s arm strength at a seven out of 10, saying the highest grade he’d given in that category was a nine. Palmer also noted T.J.’s “very solid” mechanics. There are other options if T.J. doesn’t get an NFL chance right away. But that’s where Joe’s dad role takes over.